Would you be interested in selling those headlights from the 200? Possibly. I have someone interested in driver's side orange reflector that is attached to the headlight and I think the passenger side lens has a small crack. I did't look too closely at it. But, I can let you know in a few days. Last edited by TrailAgent on Sat Feb 27, 2016 8:17 pm, edited 1 time in total. Quick update. My mechanic has the engine, CIS, ECU, wiring harness, etc. out of the 200. The engine has a bit of rust on it. The oil cooler lines were completely rusted and fell apart. But that appears to be the worst of it. The mechanic will be cleaning up the engine and getting it ready for the swap with new gaskets, etc. Hopefully no big surprises. TrailAgent wrote: Possibly. I have someone interested in driver's side orange reflector that is attached to the headlight and I think the passenger side lens has a small crack. I did't look too closely at it. But, I can let you know in a few days. Time for an update. The 10VT engine is all cleaned up, painted with new gaskets and seals. Other than the oil cooler hoses, which are shot, the mechanic did not find too many bad surprises. Now, the 4000 is up on the lift and ready for the engine to come out. I'll try to get some pictures posted to make this thread more interesting. Does anyone have advice on the best place (and method) to put the intercooler? old engine is out. New engine is mounted to the transmission. Acquired a UR Quattro airbox, igloo and fuel distributor. Mechanic has the turbo engine installed and the steering, suspension, exhaust and cooling systems back together. Next step is the air intake/fuel distribution, and then on to the ECU wiring. Nice find on the UrQ air box and igloo. I could be wrong here, but I believe you need to use the fuel distributor from the 200 to make this engine work correct. Progress! All that is left is the ECU wiring, intercooler and misc hoses and such. Plan is to mount a Porsche 944T intercooler behind a replica Audi Quattro A2 grill. DE80q wrote: Nice find on the UrQ air box and igloo. I could be wrong here, but I believe you need to use the fuel distributor from the 200 to make this engine work correct. The plan is a well-tuned, simplified system that delivers the ideal fuel mixture at all speeds for maximum power. I would try to paraphrase what my mechanic explained to me, but I would probably mess it up. If the basic CIS system doesn't work, then we can put the 200 fuel distributor on. Wiring is 95% done. Porsche 944 intercooler is getting installed in the next several days. Perhaps another week and it will be finished. The mechanics are essentially finished! Picked up the car from the mechanic and drove it to work. The mechanic estimates 200 HP, and it definitely feels like it. There doesn't seem to be a limit to the power and pull in 3-5 gears. But, there is still lots to do. The mechanic found a very minor crack in the exhaust manifold, I need a custom pipe for the intercooler, the suspension parts needs to be installed and I need some custom exhaust work done. But, now that the car is back in my hands, I can start having fun driving and tinkering. I'll post some final pictures and perhaps a video soon! First, the Porsche 944 intercooler. I need to get some custom pipe made for a better fit on the right hand side of the motor. The silicone elbow is pressed up against the power steering pump. the intercooler was a lot easier to mount than the stock Audi 200 Intercooler. Only the hood release lever and center vertical brace needed to be cut. Mounting brackets are solid. So, the big mystery is the PCV valve and the cold start problem. This was a known problem with the donor Audi 200 but my mechanic thought it would sort itself out. But, the swapped engine is a PIA to cold start. It really takes some coaxing with the throttle and starter. We thought it was this odd cone filter fitted where the PCV value should go. But, when the mechanic put the proper PCV valve in its place, the car belched smoke out of the exhaust. So, he put the cone filter on and was able to start the engine. Does any one have any ideas on why this cone filter is working? Second problem is leaking fuel injectors. This is probably the root cause of the cold start problem, but the mechanic didn't use Audi 200 injectors or fuel system. Any idea on why the fuel injectors leak? Did you replace the seals on the injectors, or test the spray pattern before installing? I'd start there and check both. Did you ever find a spare oil cooler set up? I've had one kicking around that needs a home if you have not. Yes, the mechanic tested the seals and injectors. We had three sets to choose from, Audi 200, UR Quattro and Audi 4000. 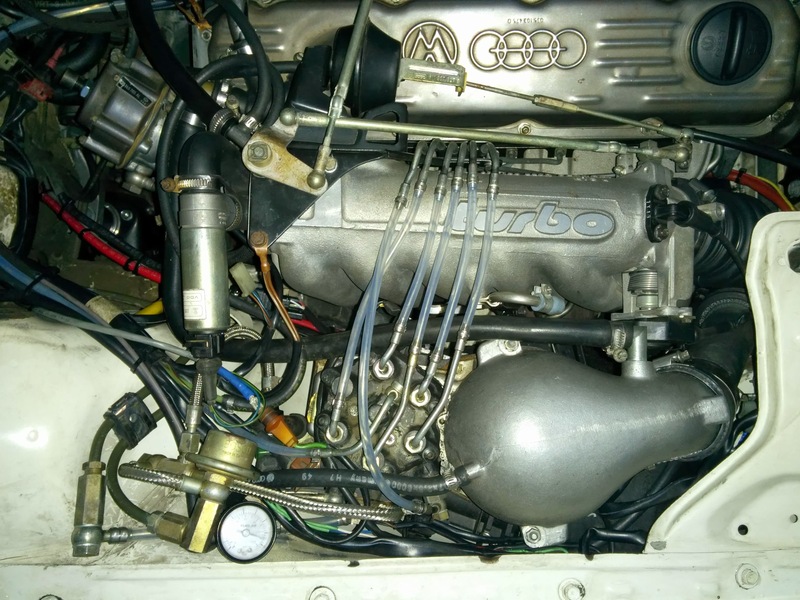 Of the bunch, the Audi 4000 injectors were the cleanest. But, the way my mechanic explained it, the injectors are leaking fuel into the interior of the intake manifold/engine, not on the exterior around the seals, if that makes sense. I was able to get an oil cooler. Thanks for asking. Since you're running the old K-jet system, an open crankcase breather is a no-no. They don't like that at all. On my old NG I couldn't even pull out the dipstick and the car would die. All the injectors are leaking? I don't know kjet so I can't definitively point to the fuel resting pressure adjustment. Can anyone confirm? When the mechanic connected the hose from the crankcase to the intake igloo with a PCV valve, smoke belched out of the exhaust. So, either engine pressure was too low to open the PCV valve, or the PCV valve was defective or I shouldn't use a PCV valve. Would using a hose without a PCV valve be a major problem? If I don't use a PCV valve is there an inexpensive solution to avoid oil vapor from condensing in the intake when the engine is off? You really need the PCV system hooked up. CIS is very picky, and looks at the little filter on the back on the valve cover as a vacuum leak. Now that you are driving it, do you notice that filter getting wet? I would try getting it hooked back up with a catch can. It actually sounds like the engine needs new rings, that's a lot of blow by to be causing smoke from the exhaust. HEY! I remember reading about those fuel lines. How well did they hold up? DE80q wrote: HEY! I remember reading about those fuel lines. How well did they hold up? Hah, they work just fine. Driven roughly 10k with them, though removed now awaiting the EFI stuff. Had my fun with CIS!